Did you enjoy this video? Plz click "like"! For more awesome videos, subscribe our channels!! Daily update available! ? Watch more clips of Super Junior!! [Weekly Idol EP.368] OPPA, OPPA 2x faster ver. 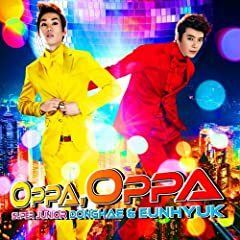 OPPA, OPPA 2x faster ver. ?? ?? 2??? ???? BPM?? ???? D and E [Weekly Idol] Global No.1 KPOP IDOL CHANNEL, ALL THE K-POP! cr: @teukienickie | https://twitter.com/teukienickie/ DO NOT REUPLOAD! 111225 Donghae & Eunhyuk, Amber, Shindong.